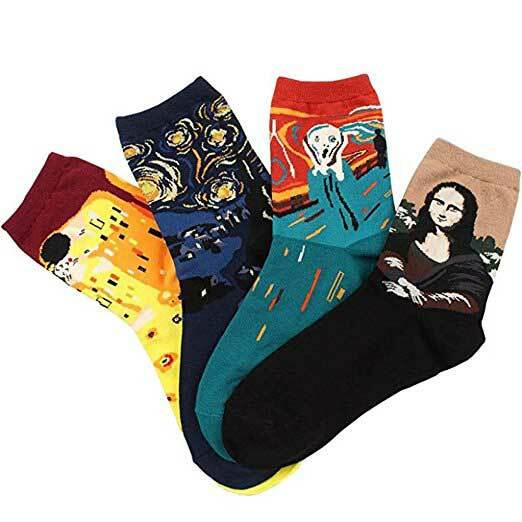 These are cool socks for artists that show display the most famous artists and artwork throughout history. The socks depict Gustav Klimt, Leonardo da Vinci, Vincent van Gogh, Hokusai, Sandro Botticelli, and other popular artists. You can see the different packs of socks though the product link. These socks feature famous artwork and artists like Vincent Van Gogh, Leonardo da Vinci, Gustav Klimt, Hokusai, Sandro Botticelli, Raphael Sanzio, and others. There are different bundle packs you can choose from. The socks fir women with shoe size 6 to 9 and men’s shoes size 4 to 7. They are made of a cotton blend, so they are comfortable and will stretch. The socks are one size fits most. The socks are soft and have a very cool and fashionable designs. There are 5 different collections to choose from with a number of famous artists and artworks like Vincent Van Gogh’s Starry night, Hokusai’s The Great Wave off Kanagawa, The birth of Venus, Edvard Much’s The Scream, and many more. You can see them all on Amazon through the link at the top of the page. The socks measure about 23 to 25 cm and are best for women with shoe sizes 5 to 8.5. The are made from a durable and comfortable cotton blend.